This week on Curmudgeon’s Corner, Sam and Ivan do their duty and talk about the tax bill… how the Republicans managed to get it done, how it will impact people, and what the political ramifications are. Then they put politics aside for a bit and talk about movies. All kinds of movies. From Star Wars to Dunkirk to Ninjago and others. Rounding out the show, some bits on Apple slowing down phones, Bitcoin, Ivan meeting an (acting) ambassador, an update on Puerto Rico… and more! How’d the R’s pull it off? 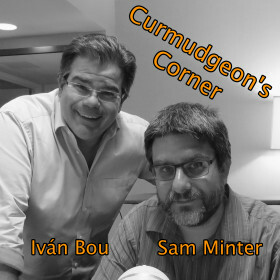 This week on Curmudgeon’s Corner, Ivan is back from Moscow and joins Sam to talk about his impressions of Russia. They also hit most of the last week of Trump administration craziness, they talk about Franken, Franks, Conyers, and Moore as part of the latest round of sexual harassment fallout, and they round it out with a little discussion of Bitcoin, CryptoKitties, iPhone X, and even Sam’s somewhat different Christmas tree. This week on Curmudgeon’s Corner, Sam and Ivan do eventually talk politics… namely Donna Brazile, this week’s election results, and the accusations against Roy Moore… but first they talk about some more pedestrian things. Ivan has ants! Sam and his wife have issues with iPhones! Sam and his family have an adventurous vacation! So a lot of everything this week. Enjoy! This week on Curmudgeon’s Corner, Sam and Ivan go lightning mode for the whole show, just covering a wide variety of random topics. Everything from some gripes about iOS, to the viral “me too” explosion, to Trump’s ability to be empathetic, to the situation in Kurdistan, to our thoughts on a 35 year old Star Trek movie, to healthcare, to geoengineering, to variety in podcast listening… and much much more! We’re all over the place this week, so there will almost certainly be something you enjoy! This week on Curmudgeon’s Corner Sam and Ivan deviate from politics for a little while to talk some tech! Namely, Juicero, cord cutting, and Apple’s pro strategy. Of course after that they get back to the news and politics of the week… That would be Trump’s 100 day milestone, Trump’s tax plan, the budget deadline and Obama making money on speeches on the domestic side. Internationally they discuss tariffs on Canada, “The Wall”, and NAFTA. Along the way there are also some corrections, a milestone for this podcast, and Trump’s Big Red Button. Curmudgeon’s Corner: You can do that? Was it decisive? Does it matter? How many will be faithless? Who will they vote for? Record number of faithless electors?